Ripples of flutes and waves of drum rolls surge through the halls of Garfield High School. The orchestra class is practicing Claude Debussy’s La mer in preparation for their spring 2016 Side-by-Side performance at Benaroya Hall alongside the Seattle Symphony. Over a decade old, it is one of numerous mentoring programs inspiring the next generation. Breidford is one of 78 students in Garfield’s orchestra. 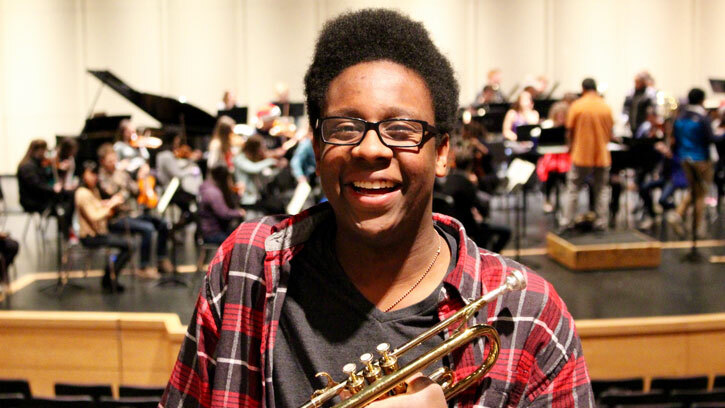 A trumpet player since fourth grade, he participated in the 2014 Side-by-Side. The experience also includes high school visits by Symphony musicians who provide instrument-specific mentoring. For the 2015–2016 season, the five Side-by-Sides also include Roosevelt High School, Cascade Youth Symphony Orchestra, West Seattle Community Orchestra and the University of Washington (UW). “There is a real wow factor to the synergy of these professionals working with the students,” says Marcus Tsutakawa, orchestra conductor and chair of the performing arts department at Garfield High School. Tsutakawa considers La mer as a challenging piece for high schoolers, but his students are motivated to learn. Symphony musicians provide specific tips for technique, encouragement to practice and bonding over shared enthusiasms. Mentoring offerings are funded by the Symphony with additional support from the City of Seattle’s Office of Arts & Culture, King County’s 4Culture and generous support from donors. In addition to Side-by-Sides, mentoring outreach includes the Merriman Family Young Composers Workshop. Upwards of a dozen middle and high schoolers partake in a 12-week program developing original chamber music in partnership with Symphony musicians. For those focused on performing, the Young Artists Auditions is an opportunity to receive coaching and feedback regarding the audition experience. Youngsters range from elementary age to high school and a handful are selected to perform a part in the Seattle Symphony’s programming. Some receive further mentoring by Ludovic Morlot, Seattle Symphony Music Director. “Mentorship is something the world should embrace. It’s something that is due to every soul on this planet. What can we commonly create together?” Morlot says. Morlot credits much of his artistic development to the diversity of mentorship he received. He now plays it forward by being an accessible role model to the next generation. He is the chair of orchestral conducting at the UW and works closely with individual students. “You’re working with someone who’s such a professional, but he comes to your level and reminds you that the whole purpose for all of us is to make great music,” says Abbie Naze, first-year UW graduate student in orchestral conducting. Per Morlot’s instruction, Naze found herself conducting the first movement of Beethoven’s Symphony No. 5 with only her eyes. With hands firmly at her sides, she led 60 of her peers in an epiphanic moment. The benefits to students are clear, but it is also a rewarding endeavor for symphony musicians and strengthens the organization. For some, the road from student to Seattle Symphony is full circle. Jonathan Karschney participated in three Side-by-Side performances as a Garfield High School student. He’s now Assistant Principal Horn with the Seattle Symphony, playing alongside musicians he admired as a teenager. He has since mentored students at his alma mater. As a student, violinist Mae Lin played a solo with the Seattle Symphony as the winner of the Seattle Youth Symphony Orchestra’s (SYSO) Concerto Competition. Now a member of the Symphony’s first violin section, she still remembers the awe-inspiring experience of playing Benaroya Hall for the first time. It’s invigorating to witness that in the next generation. “It’s important to reduce any perceived barriers that might make people not normally attend a concert or listen to classical music. By going out and making the effort to engage different communities, we’re doing a great service to music,” Lin says. Thank you to generous sponsors and supporters of the Seattle Symphony, whose gifts help fund each program included in this article. To support mentorship and student development, click here to make a gift online or call Donor Relations at 206.215.4832.